The Detroit Pistons went 44-38 last season. That's hardly anything to get excited about - just three wins better than .500. Unless, of course, you consider that it was the first time the team had managed a winning record since 2008. This team, which was once so dominant and relevant, has contributed nothing to the fabric of basketball for most of a decade. Finally, though, they are showing signs of real life. They got themselves a coach with a vision and some talent, and they are finally building something positive. Or, at least, they are in position to build something positive. Can they actually do it? Can they take another step forward this season? 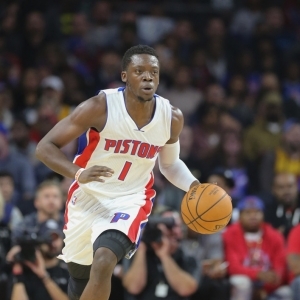 Reggie Jackson complained his way out of Oklahoma City. He wasn't content being a backup, and he wasn't going to start with Russell Westbrook in town. The show of bravado was risky - if he didn't deliver then his reputation would have been shot. He has been very good in Detroit, though. He has carried the offensive load here and has given every indication that he could take a big step forward this year. Teams need to have a strong core to compete right now, and in Jackson and Andre Drummond the Pistons have the making of a force that could contend. Drummond is already an all-star, and Jackson has every opportunity to become one as well. Added to the duo of Drummond and Jackson is Tobias Harris. Harris was acquired in a very good midseason deal last year, and he played just 27 games with the Pistons. He fit in well, was obviously comfortable, and produced at a high level. Now he has the benefit of a whole offseason and training camp to further merge into the Pistons culture and carve out his role. This is his sixth year in the league, and there is good reason to believe that it could statistically be his best. He is a guy who can rebound off the wing, and this team, which was second in rebounds last year, will give him every chance to shine on that front. If Harris was a stock I'd buy it. The Pistons didn't have the flashiest offseason in the NBA, but not a lot of teams had a better one when it came to improving themselves and addressing their needs. They made three key acquisitions in free agency, and all were strong. Ish Smith played his best ball of his career last year after returning to Philadelphia midseason. He's a dangerous playmaker with real creativity. He'll primarily be the second point guard when Jackson needs a break, but I also expect him to be used alongside Jackson at times when the team wants to make things happen. Nice player at a great price. The Pistons offered what felt like a reasonable deal to 7-foot-3 center Boban Marjanovic, but the Spurs chose not to match the offer. Last year was his first in the NBA after playing in Europe, and he showed a lot to like despite playing limited minutes. With a few more minutes available in Detroit the upside is high. The Pistons prioritized backing up their two best players - a sign of how well-run the team finally is. Finally, they added power forward Jon Leuer, who was most recently with Phoenix. He provides bench depth, can rebound effectively enough to fit in with the team, and brings some shooting chops which the team could use. He moves the needle the least of the three free agents but is still a positive. In the draft they got excellent value when they picked power forward Henry Ellenson of Marquette 18th overall. He should find a role in the rotation this year. They also grabbed senior guard Michael Gbinije from Syracuse in the second round, but it seems hard to imagine him having a large role. The Pistons were essentially a break-even team against the spread last year - they were 42-8-2 ATS. The same went for the total, where they were 42-40 on the "over". The betting mediocrity extended to their brief playoff appearance - they were 2-2 ATS, and the over was 2-2. Last year the team made the playoffs but was swept by the Cavs in the first round. I expect to see them back in the playoffs this year, but they will likely only last a game or two longer. I like how the team is being built, and they are no worse than the third-best team in their division -- behind Cleveland, obviously, and in a dogfight with the Pacers. I expect improvement this year, and I expect them to be a consistent playoff team going forward - though not a top contender unless something changes.